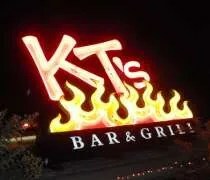 Hey, why not start of the 2009 with a review of a chain restaurant? J’s mom picked up a gift card for Chili’s for me for Christmas. Just like Applebees (review HERE), I have never been to a Chili’s. Growing up in the Kankakee (IL) area, there was no Chili’s and by the time I moved to Peoria, I was already on my “hunt out the local joints” kick, so I never took the time to actually eat at Chili’s. J said she used to eat there all the time when she lived in Idaho Falls (ID) because they had great drinks and appetizers, so when I opened up the gift from her mom on Christmas and found a Chili’s gift card, J got excited that she was going to get to take me to what could maybe be called her favorite chain. The Chili’s Grill & Bar in the Lansing metro is in Okemos adjacent to the Meridian Mall. It sort of shares a parking lot with the Olive Garden. Our plan was to hit up Younkers at Meridian Mall then go to dinner, but we were too late for shopping as the mall must have closed at 6:00 and we arrived closer to 6:30. Since we couldn’t go shopping, we just headed over to Chili’s for dinner. 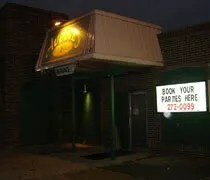 I originally reviewed Barley’s American Grill not long after moving to Lansing. At that time, I had no idea it would become our regular hangout. 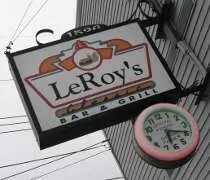 Both J and I enjoyed the food and the atmosphere, but we’re not really “go out for a beer” regulars. Every now and then it’s nice, but we’ve never really had a regular hangout. A few weeks after the initial review, J got a new co-worker and they decided Thursday night was going to be “Beer Thursday” after they got off work at 11:30. 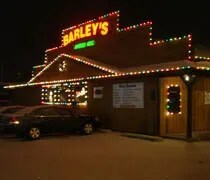 The closest bar to their place of employment is Barley’s American Grill and it’s on the way home for both of them, so that’s what they picked. Barley’s American Grill is behind the Meijer on Miller Road. It’s a huge building with a good size dining room, a good size bar, and a huge gaming area with multiple pool tables and dart boards. We have our usual booth along the back wall and our usual waitress who doesn’t even come over to ask what we want anymore. Since it’s 11:30 at night, we usually don’t go for large food items, but we do get a couple appetizers. Auggie's Grille & Pub on Miller Road in Lansing. I hate writing bad reviews. I always feel bad, but I’m not going to not write about a place just because it might make me feel bad. I always look for the good in things because I know a bad review can be bad for business. If someplace just pisses me off though, I sort of feel like they deserve it.